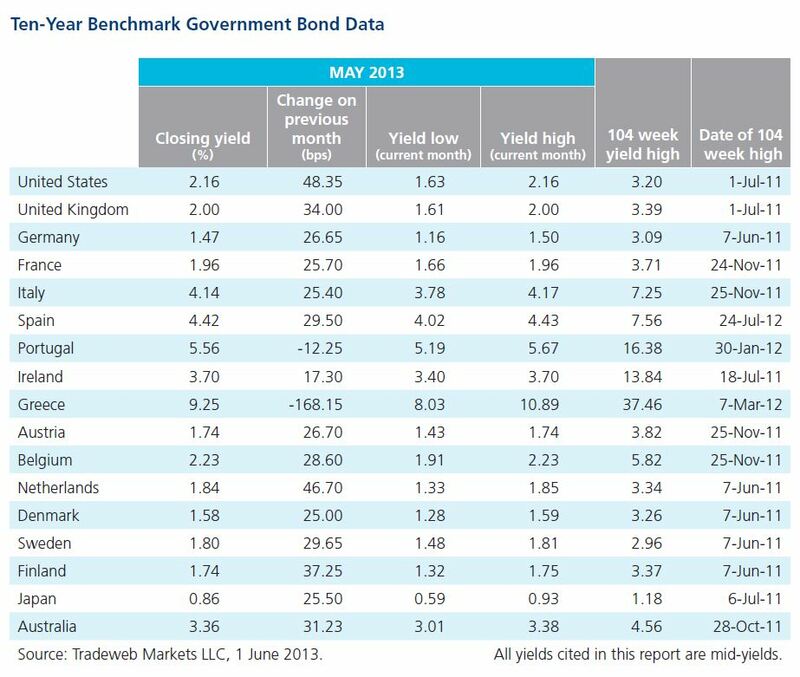 Treasury yields climbed 52 basis points in May of 2013, with the yield on the 10 year note rising from 1.61% on May 1st to close the month at 2.13% after hitting a 14 month high of 2.23 on May 29th. The moves coincided with a series of strong reports on U.S. economic data, including the highest Consumer Confidence reading in the last five years and the highest existing home sales numbers since August of 2008. This combination of upbeat data was garnished with comments by Federal Reserve Chairman Ben Bernanke, who implied that the Fed’s QE3 bond purchases may soon taper off. Tradeweb customers were active participants in the volatile market, helping to drive Treasury trading volumes for May up 14.3% over the same period last year. 10-year government bond rose 40 bps. The German 10-year benchmark bund sold off by 27 bps from its near-record low of 1.15% on May 2nd to close at 1.47% by the end of May.